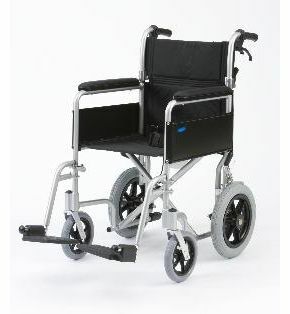 Lightweight Transit Wheelchair With Attendant Brakes. The Enigma Transit Wheelchair is very light in weight. Excluding the wheels, it comes to just over 8kg. Fully assembled and ready for use, that figure goes up to a very reasonable 12.4kg (a shade over 27lb). When not in use it can be folded up neatly for transport or convenient storage. Although light and foldable enough for occasional use, this is also a fully-featured wheelchair. The seat is a generous 18" wide, it comes with attendant cable brakes, adjustable footrests, and nicely padded armrests. Weighs just 8.5kg (18.7lb) with parts removed. Weighs only 12.4kg (27.3lb) in total.